Port Blair, Jan 24: A foreign Fishing Vessel Long Wang Hsin was confiscated on 12th Jan 2014, following which an FIR was lodged by PS CCS and 45 tons of fish was seized. Soon after the confiscation of the vessel, a firm named M/s Balaji Food Ltd. filed an application before the Chief Judicial Magistrate at Port Blair for release of 33.80 tons of fish out of the estimated 45 tons. 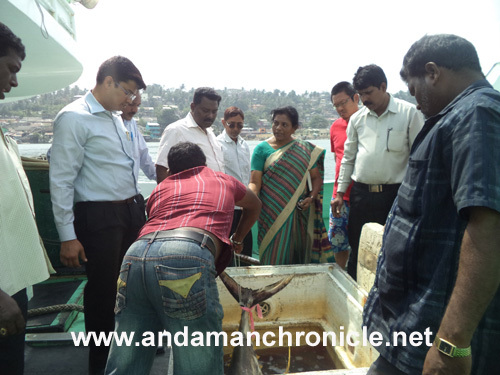 The CJM at Port Blair passed an order dated 17th Jan 2014 and directed the authority concerned to release 33.80 tons of fish. On the same day, the CJM at Port Blair had directed the I.O. to hand over 11.20 tons of fish to the Director of Fisheries, A&N Administration for disposal. The A&N Fisheries Coop. Federation Ltd. smelling irregularities in the process of disposal of the catch stored inside Long Wang Hsin, have raised objections on the procedure adopted and have demanded that the Court Order be challenged. In a letter to the Lt. Governor AK Singh, the Chairman of the Federation B. Hemaraju said, “It appears from the report published in The Daily Telegrams dated 22nd Jan 2014 that the Director of Fisheries published an auction notice for auctioning the said 11.20 tons of fish. From the auction notice, it is found that the intending bidder has to deposit an amount of Rs. 28,000/- as security deposit before the auction but the Notice is silent about the quantity of fish in respect of the named fishes, which has not been mentioned in the auction. Though the authorities have mentioned the name of fish like Marlin, Sail, Sword and Tuna, the quantity of the fish separately has been omitted. Apart from this the reserve estimated price has also not been mentioned”, he said. The Federation has alleged that there is a grave illegality by various authorities at different stages, which has in fact given undue advantage to M/s Balaji Sea Food Ltd.
“The total quantity of fish is 60 tons approximately. However, it has been presented everywhere, even before the Court of Law that the total quantity is 45 tons”, Hemaraju explains. It was also mentioned that the foreign Vessel Long Wang Hsin has been illegally trafficking in fishes of Indian Sea. Under such circumstances, how the fish can be released to M/s Balaji Sea Food Ltd, Hemaraju said while alleging that neither the Investigating Officer nor the Ld. Assistant Public Prosecutor objected to the ownership of M/s Balaji Sea Food Ltd. in respect of 33.80 tons of fish. “It never happened in the past that the fish belonging to Indian Sea is released in favour of a party whose ownership has not been established in accordance with law. If no action is taken in this regard, the order will become a precedent and would send wrong signal for illegal fishing in the Indian Sea”, he said. The authorities have projected that altogether 45 tons of fish was found in the vessel. M/s Balaji Sea Food Ltd. Claimed 33.80 tons of fish. The claim is not based upon cogent evidence. Despite such fact, the authority did not object. “We have come to know that claim is based upon a catching report given by M/s Balaji Sea Food Ltd. to the Coast Guard where the quantity of fishes is mentioned. If that is so, the quantity mentioned by the authority appears to be more than the quantity postulated in the catching report. Hence it is clear that Balaji Sea Food Ltd. has placed false catching report before the Coast Guard and all these facts were suppressed by the authority”, Hemaraju said. “Balaji Sea Food Ltd. with malafide intention mentioned in its application that the market price of 33.80 tons of fish is Rs. 3 Lakhs, whereas it would be more than Rs. 10 Lakhs. Even to such violation, no objection has been raised by the Investigating Officer or the appropriate authority. This has also been done in order to get the vessel released upon payment of minimum fine at the subsequent stage”, the Federation’s Chairman Hemaraju alleged. The Federation has requested the Lt. Governor through its letter dated 22nd Jan 2014 to direct the Public Prosecutor to challenge the order dated 17th Jan 2014 passed by the CJM at Port Blair before the appropriate court and to constitute a committee to monitor the sale of fishes on auction. It also requested modification of the auction notice by mentioning the quantity of each category of fish separately and fix a reserve price. Till such time, the auction be stopped, requested the Federation.